If I was a poster, I wouldn't want to be folded up inside a comic book. If I was a comic book, I wouldn't want pages of me removed and tacked up on somebody's wall. Fortunately, I am neither a poster nor a comic book. 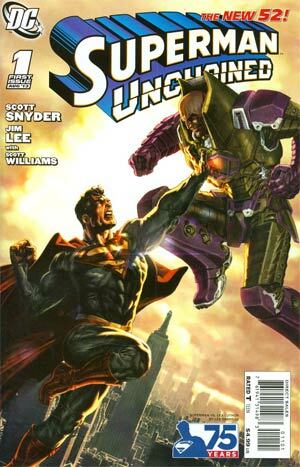 Unfortunately, Superman Unchained #1 is both. It's not that I don't like comic books or posters. Indeed, there might not be a single room in my house that doesn't currently have at least one or the other, and just as likely both, located somewhere within it. However, I am of the mind that they don't really belong together. Combined, in other words, they are less than the sum of their parts. As a collector of comic books on the one hand, I am partial to preserving the original integrity of my books to the greatest possible extent, not only for the potential appreciation of a given book's value but also for my natural preservationist sympathies, irrespective of values etc. One vote against removing the poster. Meanwhile, as someone who collects comic books principally because I appreciate the talent that goes into making them, I am also partial to hanging oversized prints of comic book art on my walls. 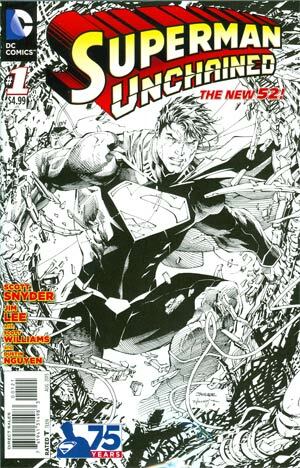 Indeed, I have respected Jim Lee's work since he first rose to prominence in the early 90s at Marvel, though his role in the advancement of the many print-technique gimmicks that were introduced at the same time (and nearly killed the entire comic book industry) takes some of the luster off his shine. 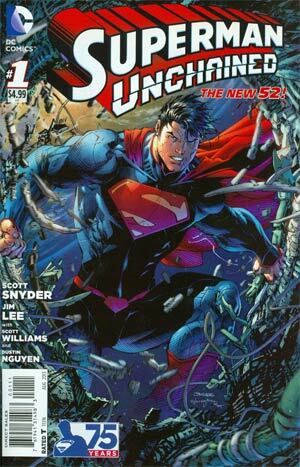 But, either way, I have a framed poster of his cover to Superman Volume 2 #204; it's on the wall behind me as I type. One vote for removing the poster. How will I decide? Normally, if I really cared, I'd buy two copies: one for reading and de-postering, the other for bagging, boarding and boxing. But the poster in Superman Unchained #1 is different than your average bonus insert - it integrates the story, including text, right onto it. That means, once it's out, the story is broken. And there's the deciding vote. 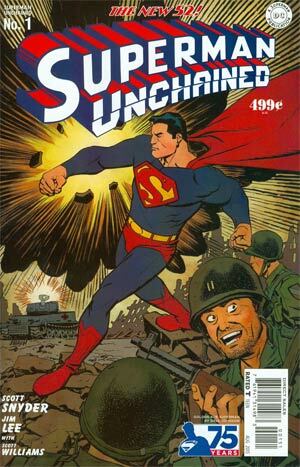 I get it - this little gimmick serves literally to "unchain" our boy from the confines of standard comic book dimensions, just as Lee and writer Scott Snyder, whose work on the New 52 Batman has made me a fan for life, will endeavour, one expects, to unchain him from...well, whatever it is he has been chained to (that part hasn't been made clear yet). If I had to advance a theory in the case of this first issue, though, I'd say it's history. 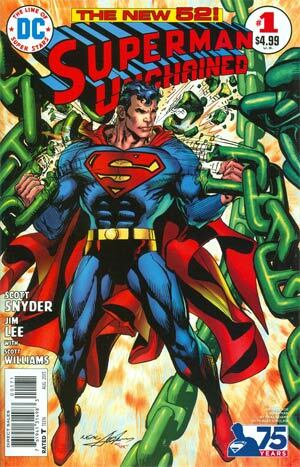 Superman has been chained to history, his own especially, and that's all about to... something. Change, maybe? Now. 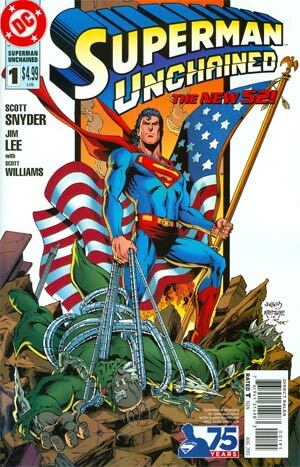 Superman is en route to a space station that is in the midst of catastrophic failure, thinking about the days of youth in Smallville as he crashes into the side of the station in search of its occupants. After some hurried and free falling creative thought, Superman figures out a way both to disarm the station's nuclear core before it explodes and save the astronauts. This, meanwhile, is on top of six satellites he also prevented from crashing earlier in the day. He suspects, as you might expect, Lex Luthor, currently incarcerated and in the middle of being transported to Metropolis's new maximum security detention center, The M.A.W. Luthor denies involvement and suggests cyber terrorist organization Ascension, which Superman dismisses because this kind of stuff, he says, is "too big" for them. 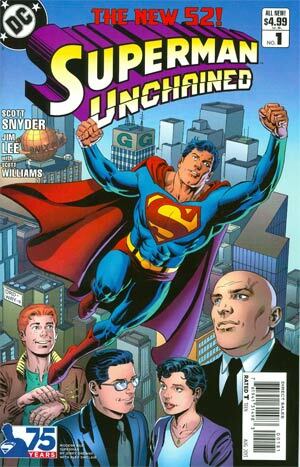 The story clearly takes place in the New 52's present, as Clark Kent is still relatively fresh off his departure from the Daily Planet (see Superman #13), though long time fans will be pleased to see that all of Lois Lane, Jimmy Olsen and Perry White appear to do their bits - Lois to challenge and guide Clark, Jimmy to serve as his comic foil, and Perry to just be reasonable and gruff as ever. Indeed, it's Lois's criticism that Clark is "slipping" that gets Superman back to the scene of his earlier heroics for the chapter's third and final act. 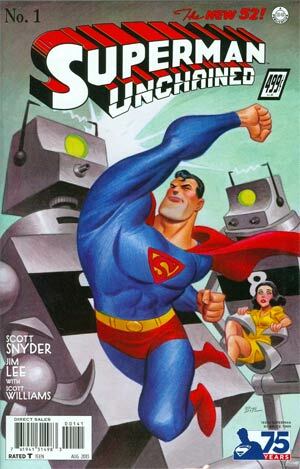 It isn't clear what happens between Superman and the submarine. 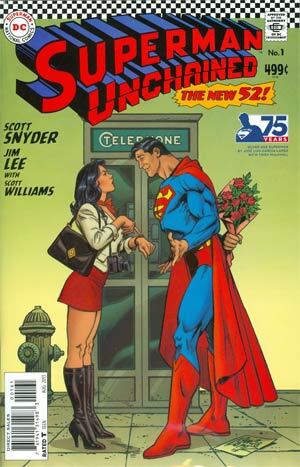 Nor is it clear who the guy in the Epilogue with the burned out eyes asking for Lois Lane is. It is clear, however, that this guy at the end (whose name has lately been revealed to be Wraith) is the same figure that busted out of the bomb at the beginning of the issue, back during World War II, and that he takes the place of the nuclear bomb in this timeline (or however the kids put it these days, though I couldn't say whether the "April 9, 1945" noted in the caption is a mistake or intentional - i.e. the actual bombing of Nagasaki was August 9, 1945). For my part, my response to all of this was a pretty definite "Meh." Art - 5: Maybe it's that I recently had my fill of offshoot shadows of the truly real Man of Steel thanks to Injustice: Gods Among Us, or maybe it's the cliché pose Lee has the guy in in his reveal panel despite pretty much every other panel being top notch, 5 of 5 kind of work. Truly, that poster may be the stuff of nightmares for casual readers and serious collectors alike, but the artwork that graces it and this entire book is spectacular. Cover Art - 5: Including the cover. I'm not going to review each of the variant covers, though. There's really no point in looking to me for a statement or two on the relative merits of a bunch of different Superman scenes, all done by different artists in different styles. They all have their charm. I'm also no fan of the current cover variant paradigm, anyway, and would prefer to say no more about this at this time other than to say that I bought one copy only of this book, the standard one. And it's now fingerprinted and bent to hell thanks to all the fooling around with that poster. Maybe it's also that this is a new character in whom I'm not in any way invested and so can't really be expected to have much of a reaction one way or the other. You know? Actually, in some ways, that's better. I mean, if it had instead been Doomsday standing there, I'd probably be annoyed. And anyway, it's not the character and his design so much as that seventy-five years that's supposed to snare you. Because history. 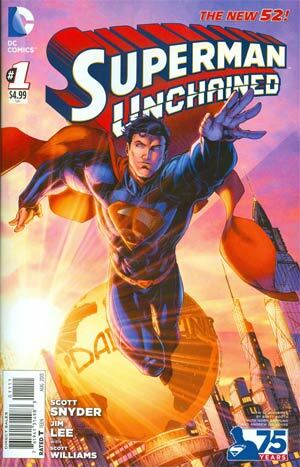 In this opening chapter to what I believe is his first ever Superman story, Snyder covers a lot of ground, not only in terms of including all of the arguably indispensable supporting characters that help to define our boy (Lois, Jimmy, Perry and Lex [plus General Lane]) but also in terms of the underlying ideas that motivate him to begin with: family, friends, justice, truth. Also the American Way, I suppose, though that one's always a moving target for me, sorry, being Canadian and all. Though we are here in Superman's present, we are also treated to echoes of both a past he knows ("The Colder Leap") and one he doesn't (Wraith as the "real" Superman). And it's that one, the one he doesn't know, that first threatens to be unchained, a break not merely from physical constraints (cf. the poster) but from metaphysical ones as well, what with Wraith's intra-narrative history matching up in length with Superman's real-world history and dwarfing the mere five or so years of time that Superman has existed within the post-Flashpoint universe they both inhabit. Wraith seemingly is the real Superman. Story - 4: This is crafty, and I'm looking forward to seeing where it goes. But I'm compelled to quote what my good friend Shawn Morrissey had to say about the issue: "It was exceptionally generic. I guess there's going to be some sort of consequence from the Nagasaki bombing sequence, but overall it was pretty tired. It took me two sittings to read it." I had the same experience, and it wasn't until I finally found the time to sit down and write this review that I could better appreciate the potential to which this opening chapter might be pointing, thus why I give its story a 4 instead of a 3.